Much of the economic literature on the EU and the Eurozone in the past few years has focused on economic stagnation, the successive periphery debt crises, and the risks of a potential breakup of the single currency (Krugman 2012, Blanchard and Leigh 2013, Stiglitz 2016). Accompanying – and exacerbating – these years of crisis management has been an investment slump. Corporate investment alone fell by €200 billion between 2007 and 2009, and the real estate collapse added to the decline. While investment has since crept back to 2007 levels in absolute terms, as a share of GDP it remains at its lowest level in more than 20 years, at just 19.5%. At a time of ultra-low interest rates, this paltry investment performance has fed in to the lively global debate about secular stagnation (Summers 2016). For companies, it has been a missed opportunity, as the spread between the returns on investment and interest rates have widened in many economies. Companies across Europe have started to stack up cash and have effectively become net lenders rather than seeking credit. At a time of weak investment, as of 2015, EU gross corporate savings totalled €1.97 trillion, about €410 billion more than gross savings of €1.56 trillion in 2009. Since 2007, corporate savings have exceeded investment by 1% of GDP on average. In Germany, for instance, gross corporate savings in 2013 amounted to 13% of GDP, while gross corporate capital formation was just 11% of GDP. With the EU economy now showing clear signs of a revival, the question is whether investment can finally revive. Much is riding on the answer – without a return to stronger investment, especially (but not only) corporate investment, Europe will continue to lack a motor for sustainable economic growth (Enderlein and Pisani-Ferry 2014). If overall investment levels were to return to their pre-crisis proportion of GDP by 2020, we estimate that European GDP could expand by an additional €1 trillion in 2030, or adding 5.7% to baseline GDP (Bughin et al. 2017b). On the positive front, our survey indicates that a majority of companies no longer seem to see a shortage of investment opportunities within Europe – 51% of respondents saw more opportunities than they could fund, and companies have increased investment accordingly. Not surprisingly, the best-performing firms will be the ones to accelerate investment growth. 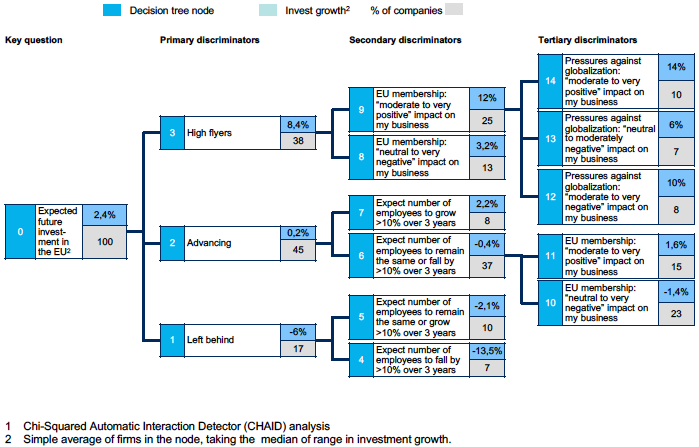 Clustering companies into three groups – ‘high flyers’ (profitable companies that expect more than 5% growth in their demand next year), ‘advancing companies’ (profitable companies with positive revenue growth for next year), and ‘struggling companies’ (non-profitable companies that do not anticipate revenue growth) – we find that 47% of high flyers will relaunch investment by at least 10%, compared with just 6% that will reduce it, while the remaining 47% will invest at about the same pace as last year. Among advancing companies, 30% will grow investment, 10% will reduce it, and 60% will not change plans. Could investment be even stronger? It is notable that access to finance – an issue that was much discussed after the crisis – played almost no role in the eyes of corporate respondents. Consistent with the macroeconomic picture of a cash build-up, companies have increased their cash position. That is good news, in that 48% of companies said they were building cash for future investments, but also bad news, since about the same proportion of firms (47%) said they were building reserves for future crises. While some deleveraging is taking place, the portion of companies identifying debt repayment (18%) or excessive debt levels (9%) as a reason for their cash hoarding is much smaller than for the other two explanations. On the negative side, the picture remains qualitatively the same even if we split the sample of companies between ‘high flyers’ anticipating major increases of revenue growth and other, more struggling companies. We used a battery of statistical analyses to undertake a closer examination of investment reluctance by European firms. In particular, we tested expectations of how major global trends can impact business, and how the specifics of Europe could interact with private investment decisions (Bughin et al. 2017b). Some of the insights we gleaned were about investment behaviour and the relation to global trends and feelings about Europe. While we looked at a list of 11 global trends, from digitisation and globalisation to migration and climate change, we found that for a large majority (two thirds) of firms, only 3 out of 11 trends are globally positive. For 20% of companies, all of those trends were expected to have a negative impact on their business. For Europe, we asked companies both how they benefitted from Europe as a market as well as an institution to enable businesses. A majority of firms (53%) answered that Europe had a positive impact on their business, and 60% wants even more of Europe. Those figures, outside UK firms, rise up to 65% of firms. Not surprisingly, the strongest determinant of expected growth in investment in the EU was historical cash flow growth and future demand. But we also discovered that beyond risks of another financial crisis, new fears about rising populism, growing anti-globalisation sentiment, and a range of geopolitical risks have emerged as the potential barriers to investment. As a case in point on how this plays out, and its relevant magnitude, consider the European service industry as a whole in Figure 1.3 The expected growth in investment to revenue ratio for next year is 2.4%. This is especially driven by a boost of 8.4% by high flyer firms. Advancing firms are not accelerating their investment rate that much, and left behind companies are shrinking, being responsible for a one point reduction in the investment ratio at the European level for service firms. However, Europe has an important effect on those patterns. For instance, high flyers that find Europe at best neutral will only boost their investment by just above 3% versus 12% for those perceiving Europe as a moderate or positive force for their business. This amounts to a major acceleration of investment. Likewise, sentiment perception on the pressure of globalisation trends can halve the investment rate. Source: McKinsey Global Institute Business Survey, 2017; McKinsey Global Institute analysis. Based on those results, we see some clear calls for action. First, among all the trends investigated, European business leaders see digital technologies as a significant opportunity for reshaping their companies, despite some concerns about the disruption they can cause. High flyer companies are especially highly positive about digitisation. Digital more broadly could present one of the greatest opportunities for public and private investment. Here the EU is lagging behind the US and even China, including for artificial intelligence (Bughin et al. 2017a). Overall, the EU is currently realising about 12% of its digital potential, compared with 18% in the US. (Bughin et al. 2016). Second, the geopolitical concerns business leaders cited in the survey, such as migration and populism, are relatively hard to tackle, although stronger concertation could help. Is institutional reform essential? Business concerns about the Eurozone’s durability suggest that some important confidence-building measures will be needed – it remains to be seen whether French President Macron can persuade Germany and others to reform Eurozone governance, as he suggested during the election campaign. Business leaders also told us that, even if they want more Europe, they have clear doubts about the ability of EU institutions, including the European Commission, to deliver on policies, although they nonetheless tend to view the policies themselves, including the Commission’s ten priorities, relatively favourably. The Commission is on track to mobilise more than €300 billion in additional investment in the economy by mid-2018 through the European Fund for Strategic Investments, launched in 2014 (European Commission 2016). Some critics have questioned whether this is truly ‘additional spending’, however (Claeys and Leandro 2016). Governments in the Eurozone could also ease some of the lingering fears we found by addressing areas of fragility. They include remaining financial risk – banks in Southern European economies in particular still face significantly high levels of bad loans. In Greece, more than one-third of total gross loans in 2015 were non-performing, while in Italy the proportion was almost 18%. In the EU overall, the proportion of non-performing loans, at 5.6% of total gross loans, is more than three times that of the proportion in the US or Japan (World Bank 2017). Third, besides private investment, governments could set an example with some well-focused, productive spending – in conjunction with business. Some 80% of respondents see a case for higher public investment, and about 30% even if it meant higher taxes. 73% of respondents say that they would co-invest in productive public investment, so crowding in seems more likely than crowding out. That is especially relevant in Germany, where weak domestic spending has contributed to a soaring current account surplus, which has risen to more than 8% of GDP, triggering complaints by the US and others (Mattern and Mischke 2017). One obvious area for spending is the physical infrastructure underpinning the digital economy. In the first quarter of 2017, for example, just 33% of German internet connections had average speeds above 15 Mbps, well behind leaders such as South Korea (69%) or Switzerland (56%). There is no shortage of funds to upgrade to high-speed broadband – German government investment in 2015 amounted to 1.8% of GDP, well below its high in 2007 of 2.5% (Windhagen et al. 2017). Fourth, beyond the economic, financial, and institutional fixes that could help restore confidence, we hear a broader and recurrent theme – the EU needs to develop a new narrative about its role and vision for the future that shows that the forces in favour of cooperation are stronger than those opposing it (Lamy 2016). That is easy to say, and much harder to enact. But the stakes are very high indeed. After a ‘lost decade’ for Europe’s economies, a resurgence of corporate investment is needed to sustain the economic and business recovery now underway—and banish the spectre of secular stagnation that has loomed so large for so long. Authors’ note: The views expressed in this column are those of the authors and do not necessarily represent those of the institution(s) with which they are affiliated. Bughin, J, E Hazan, S Ramaswamy, M Chui, T Allas, P Dahlstrom, N Henke, and M Trench (2017a), Artificial intelligence: The next digital frontier?, McKinsey Global Institute, June. Bughin, J, E Labaye, F Mattern, S Smit, E Windhagen, J Mischke, and K Bragg (2017b), European business: Overcoming uncertainty, strengthening recovery, McKinsey Global Institute, May. Bughin, J, E Hazan, E Labaye, J Manyika, P Dahlstrom, S Ramaswamy, and C Cochin de Billy (2016), Digital Europe: Pushing the frontier, capturing the benefits, McKinsey Global Institute, June. Claeys, G, and A Leandro (2016), “Assessing the Juncker plan after one year”, Bruegel, May. Enderlein, H, and J Pisani-Ferry (2014), Reforms and Investment and Growth: An Agenda for France, Germany and Europe, Report to the French Minister for the Economy, Industry and Digital Affairs and to the German Federal Minister for Economic Affairs and Energy. European Commission (2016), Europe investing again: Taking stock of the Investment Plan for Europe and next steps, June. Krugman, P (2012), “Europe’s economic suicide”, New York Times, April 15. Lamy, P (2016), Report of the chair of the judging panel, in “An opportunity for Europe? The McKinsey Global Institute 2016 Essay Prize. Key themes and winning entries”, October. Mattern, F, and J Mischke (2017), “Turning Germany’s ‘bad’ trade surplus into a good experience for all (including Germans)”, VoxEU.org, June 21. Stiglitz, J E (2016), The Euro: How a common currency threatens the future of Europe, W.W. Norton & Co.
Summers, L (2016), “The age of secular stagnation: What it is and what to do about it?”, Foreign Affairs. Windhagen, E, J Bughin, J Mischke, C Baur, F Mattern, and S Forman (2017), “Driving German competitiveness in the digital future”, McKinsey Global Institute, July. World Bank (2017), World development indicators. The six countries are France, Germany, Italy, Poland, Spain, and the UK. The survey was taken before the election of President Emmanuel Macron in France. We report results of a Chi-square Automatic Interaction Detector (CHAID) analysis here, as we found major non-linear effects in explaining investment decisions. The type of trends affecting firm decisions depend critically on sectors.